As a blogger who likes to have something to say in their posts and not just list items, sometimes, I struggle for inspiration. I may have a great outfit I want to blog but can’t think of anything to say in addition to just sharing the pictures. Then….sometimes, there is so much bursting to come out that I have the alternative issue of how do I get this out on virtual paper and do it all justice. That feeling right there is what I am struggling with today. So much to share, all of it good and a blank screen. I wish I could connect my head directly to the keyboard and let it write itself but I’m scared it would make more sense. Ha! When I log in for the first time each day I have a plethora of messages from various subscribos and a slew of group notices. There was one that really caught my eye this morning from coldLogic. I read the notice, sat back and beamed! coldLogic is introducing a new brand to their range called Neve which is specifically aimed at mesh bodies. Now coldLogic has been making their newest items with a SLink Physique option for some time and the majority of those work with the Maitreya Lara with a little tweaking but this is now quality clothing from them specifically made for a range of mesh bodies AND the system avatar. The good news does not stop there…. I bought two items from the store, tried to click on the colour I wanted to purchase, as this was how coldlogic items worked. You bought individual colours or a 3 piece fatpack right? Nopes, not anymore. Each of the items I bought came as a fatpack with colour changing hud, and in the case of the Neve Dominique CurlyQ in my second photograph the skirt and top can be completely different colours and textures so you have even more mix and match options. 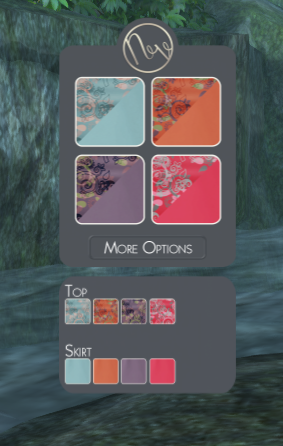 I was also delighted that the dresses both had the Maitreya auto-hide feature so it’s one of those grab and put on quick and not worry about alphas items! Be still my beating mesh pixel heart! This is a huge development for users of mesh avatars looking for the kind of quality we’re seeing from Blueberry, Addams, Just Because, Bueno etc but with a completely different look and feel to it. I am looking forward to many more new releases in the Neve range from coldLogic! I was deep in conversation with Inara Pey during the week and she told me about a sim she was producing on LEA6. I have been meaning to get over there and view her work for a few days. Inara can give you a much better background to what she aimed to achieve with Impressions than I could ever attempt. I highly recommend you visit and read Inara’s post and the information notecards you can pick up when you teleport in to the sim. Illusion Point also opened it doors this week for their latest round. I love this event, it’s smaller and easier to get into it and has some gorgeous little stores from new-to-me creators as well as some designers you will all recognise. I am really becoming a huge fan of Musa! jewelry and these earrings are available at Illusion point and come in 3 styles including a petite avatar version. I topped off my look with this group gift from Glow Designs. The clutch bag comes with a colour change hud so you can match it up beautifully to almost any outfit! There! I got it all out and I hope it was clear and informative as my mind does have a tendency to jump around more than a tad!